KCELT started the New Year with its second annual Teacher as Designer Institute. 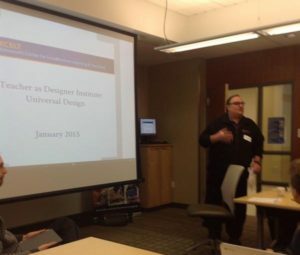 This year the theme was Universal Design, which “is an educational framework that guides the design of learning goals, materials, methods, and assessments as well as the policies surrounding these curricular elements with a diversity of learners in mind” according to http://udloncampus.cast.org/home. One purpose of this blog post is to provide faculty resources in addition to those found on our website at http://www.kirkwood.edu/site/index.php?p=35990. Another is to share what happened during the institute with the Kirkwood teaching and learning community. Dr. John Achrazoglou, Chief Technology Officer at the University of Iowa College of Education, gave an exciting keynote speech about Universal Design, which included a video of the University’s expert covering the key points of the framework and some practical solutions regarding captioning on YouTube. Below are the videos from the keynote. The main interest among faculty on the first day was YouTube, especially the ease of creating and inserting captions. Captioning enables students with hearing impairments, English language learners, and developing readers the chance to gain a richer experience of the YouTube content. John Achrazoglou and his staff provided a 60-minute workshop introducing our faculty to the various functions of YouTube. Below is a video tutorial of how to add captions to your own YouTube videos, made recently for the general public and not specifically Kirkwood. On Friday, we started the day with our colleagues, Barb Mussman and Amanda Thompson from Learning Services leading a simulation of being a student with visual impairments. We simulated activities both inside and outside the classroom environment. Below is a video of our faculty paired up with one partner helping the other who is acting as a blind person walking to class in Cedar Hall. Many faculty discovered that they were already applying Universal Design to their courses. How have you implemented Universal Design either intentionally or unintentionally in your classroom?